Brian T. Moynihan is president of Global Corporate & Investment Banking and a member of the bank’s senior management team. Moynihan has direct responsibility for the Bank of America private equity business, LaSalle Global Trust Services, Enterprise Technology and Delivery, Legal, and Supply Chain Management. He also chairs Bank of America’s Global Diversity and Inclusion Council and is an executive champion of its Disabilities Affinity Group for Bank of America associates. 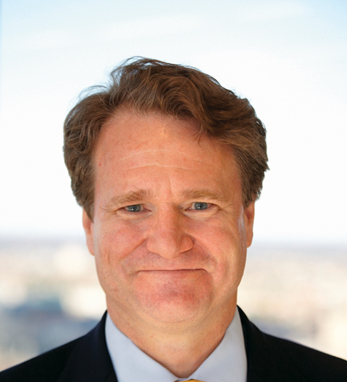 Moynihan joined Bank of America in 2004 as the president of the Global Wealth and Investment Management Unit, following Bank of America’s merger with FleetBostonFinancial. At Fleet, which he joined in 1993, he led Brokerage & Wealth Management after leading Fleet’s Internet strategy. Moynihan is a graduate of Brown University and the University of Notre Dame Law School. He serves on the boards of YouthBuild Boston and the Boys and Girls Clubs of Boston. A fourth-generation Irish-American with roots in counties Cork and Kilkenny, Moynihan is a big fan of US and James Joyce and has visited Ireland four times, including one trip to play rugby in Dublin. He lives in Wellesley, Massachusetts with his wife and three children.